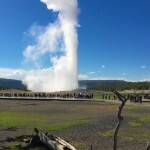 Our Last View of Old Faithful on Flickr. Our last evening my girls and I were wandering around the Lower Geyser Basin while Old Faithful was about to erupt. So we waited for it and enjoyed the show. This entry was posted on June 24, 2014 at 3:40 pm.